There's nothing quite like the sounds of jazz. Teachers have told us time and time again how well their students respond to this cool, unique musical style. 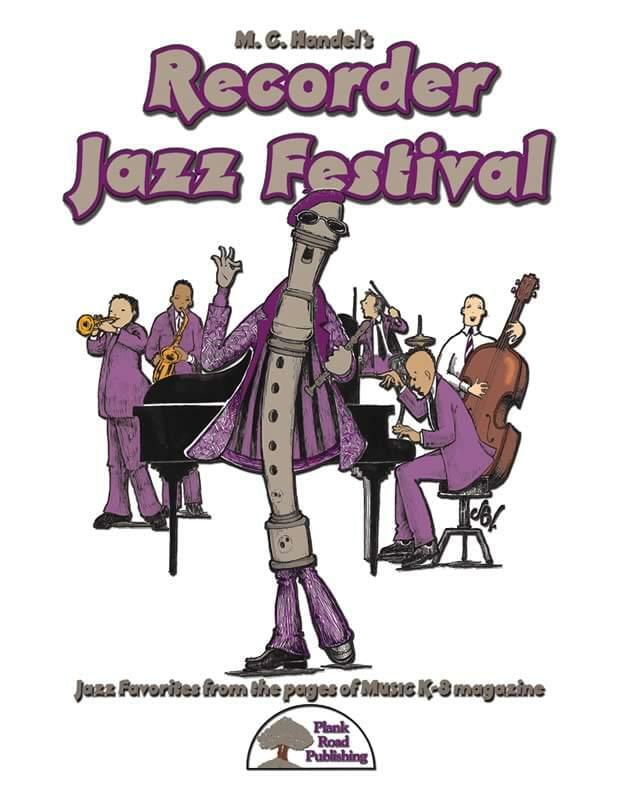 Whether it be the sound of a hot big band, some smooth Latin jazz, or an easygoing blues tune, your young recorder players are sure to find a favorite or two. This recorder collection represents some of M.C. Handel's most popular jazz pieces from the pages of Music K-8 magazine. M.C. 's Boogie - This CAGE recorder feature hails back to the old traditional "boogie woogie" first made popular by big bands like Count Basie's in the '30s and '40s. The chord structure has been updated for this foot-tapping, fun-loving tune. And while it is great for your beginning recorder players, you may want to also use it for beginning players on other instruments from keyboards to Orff mallet instruments. Rain Forest Daydream - With a lush intro of strings, synthesizers, and percussion, this tune is a laid-back piece of Latin jazz. Of course, while the orchestra is playing rich, tightly voiced jazz chords, the kids are playing their pentatonic melodies based on D, E, G, A, and B. You may also want to use this tune (or parts of it) to practice simple improvisation based on the five notes used. CAGE Full O' Blues - With this down-tempo blues tune, we have tried to create a very versatile selection that works well as a feature for beginning recorder players, but it can be much more than that. It is conceived so that it will work just fine as written. But it can also be used as an introduction to jazz performance at its simplest level for your recorder players or virtually any of your students. Scoot! - This song is a tribute to the great Count Basie Orchestra. More specifically, it is a song that was inspired by Neal Hefti's "Cute" from the late '50s/early '60s. Of course, our new tune has a totally different melody and much simpler rhythms so that the recorder players can actually play the melody with the ensemble. They actually get to be a section of the band! Firefly - Using the five notes G, A, B, C, and D, this selection is in a medium, laid-back Latin jazz style, with some syncopation. But where the recorder is required to play, there's nothing faster than quarter notes. While there is enough repetition to keep this in the appropriate difficulty level, there are a few special twists and turns that will make it a special feature for performances. It also provides a great opportunity for letting a few of your students play some form of shaker or maraca during much of the tune. Lucky Sneakers - What better way to let your recorder players join the big band than with this homage to Henry Mancini and the tight, jazzy chords he used in his TV writing? Yes, it is very reminiscent of a certain oft-quoted theme, but it does have a completely different melody - one that is playable by your young players. But like its inspiration, this song has a steady, driving pace making it a lot of fun to play along with.